Your window decorations (title bar, etc.) may appear different depending on your operating system and window manager. Although most menu options have a corresponding tool and vice-versa, the menus are not organized exactly like the toolbars. The toolbar containing the tool is listed after each menu option as a checkbox entry. Some menu options only appear if the corresponding plugin is loaded. For more information about tools and toolbars, see section Toolbar. After activating Toggle editing mode for a layer, you will find the Add Feature icon in the Edit menu depending on the layer type (point, line or polygon). When starting QGIS for the first time not all core plugins are loaded. Every menu bar can be moved around according to your needs. Additionally, every menu bar can be switched off using your right mouse button context menu, holding the mouse over the toolbars (read also Panels and Toolbars). If you have accidentally hidden all your toolbars, you can get them back by choosing menu option Settings ‣ Toolbars ‣. If a toolbar disappears under Windows, which seems to be a problem in QGIS from time to time, you have to remove key \HKEY_CURRENT_USER\Software\QGIS\qgis\UI\state in the registry. When you restart QGIS, the key is written again with the default state, and all toolbars are visible again. The map legend area lists all the layers in the project. The checkbox in each legend entry can be used to show or hide the layer. The Legend toolbar in the map legend are list allow you to Add group, Manage Layer Visibility of all layers or manage preset layers combination, Filter Legend by Map Content, Expand All or Collapse All and Remove Layer or Group. The button allows you to add Presets views in the legend. It means that you can choose to display some layer with specific categorization and add this view to the Presets list. To add a preset view just click on , choose Add Preset... from the drop down menu and give a name to the preset. After that you will see a list with all the presets that you can recall pressing on the button. All the added presets are also present in the map composer in order to allow you to create a map layout based on your specific views (see Main properties). A layer can be selected and dragged up or down in the legend to change the Z-ordering. Z-ordering means that layers listed nearer the top of the legend are drawn over layers listed lower down in the legend. This behaviour can be overridden by the ‘Layer order’ panel. To bring a layer out of a group, you can drag it out, or right click on it and choose Make to toplevel item. Groups can also be nested inside other groups. The content of the right mouse button context menu depends on whether the selected legend item is a raster or a vector layer. For GRASS vector layers, Toggle editing is not available. See section Digitizing and editing a GRASS vector layer for information on editing GRASS vector layers. You may also delete more than one layer or group at once by selecting several layers with the Ctrl key and pressing Ctrl+D afterwards. This way, all selected layers or groups will be removed from the layers list. There is a panel that allows you to define an independent drawing order for the map legend. You can activate it in the menu Settings ‣ Panels ‣ Layer order. This feature allows you to, for instance, order your layers in order of importance, but still display them in the correct order (see figure_layer_order). Checking the Control rendering order box underneath the list of layers will cause a revert to default behavior. This is the “business end” of QGIS — maps are displayed in this area! The map displayed in this window will depend on the vector and raster layers you have chosen to load (see sections that follow for more information on how to load layers). The map view can be panned, shifting the focus of the map display to another region, and it can be zoomed in and out. 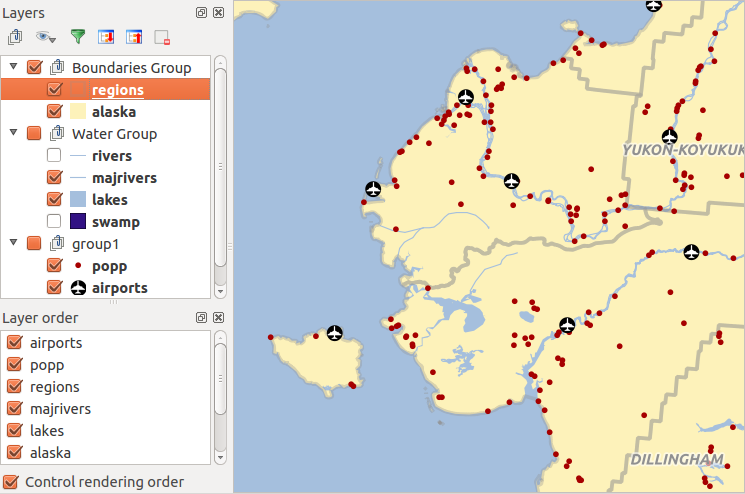 Various other operations can be performed on the map as described in the toolbar description above. The map view and the legend are tightly bound to each other — the maps in view reflect changes you make in the legend area. You can use the mouse wheel to zoom in and out on the map. Place the mouse cursor inside the map area and roll the wheel forward (away from you) to zoom in and backwards (towards you) to zoom out. The zoom is centered on the mouse cursor position. You can customize the behavior of the mouse wheel zoom using the Map tools tab under the Settings ‣ Options menu. The status bar shows you your current position in map coordinates (e.g., meters or decimal degrees) as the mouse pointer is moved across the map view. To the left of the coordinate display in the status bar is a small button that will toggle between showing coordinate position or the view extents of the map view as you pan and zoom in and out. Next to the coordinate display you will find the scale display. It shows the scale of the map view. 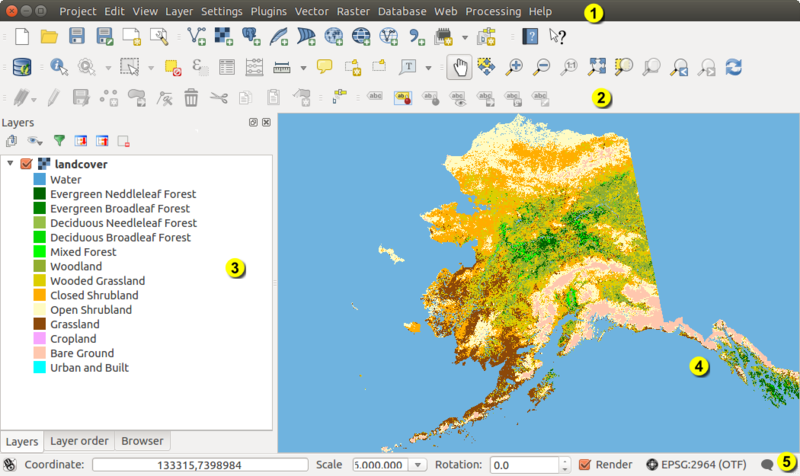 If you zoom in or out, QGIS shows you the current scale. There is a scale selector, which allows you to choose between predefined scales from 1:500 to 1:1000000. To the right of the scale display you can define a current clockwise rotation for your map view in degrees. A progress bar in the status bar shows the progress of rendering as each layer is drawn to the map view. In some cases, such as the gathering of statistics in raster layers, the progress bar will be used to show the status of lengthy operations. If a new plugin or a plugin update is available, you will see a message at the far left of the status bar. On the right side of the status bar, there is a small checkbox which can be used to temporarily prevent layers being rendered to the map view (see section Rendering below). The icon immediately stops the current map rendering process. To the right of the render functions, you find the EPSG code of the current project CRS and a projector icon. Clicking on this opens the projection properties for the current project. When you start QGIS, the default units are degrees, and this means that QGIS will interpret any coordinate in your layer as specified in degrees. To get correct scale values, you can either change this setting to meters manually in the General tab under Settings ‣ Project Properties, or you can select a project CRS clicking on the Current CRS: icon in the lower right-hand corner of the status bar. In the last case, the units are set to what the project projection specifies (e.g., ‘+units=m’).